Did we enjoy our time in the crazy, noisy, bizarre town? Did we CHASE YOU? Did we let the voice of love take us higher? Read ahead to find out! Firstly though, I sincerely apologize for letting the weekly coverage lapse. I had what I’d consider legitimate excuses for a few weeks, including familial obligations and a medical emergency warranting a hospital stay, but after that it just ended up ballooning into a seemingly insurmountable cavalcade of episodes that I needed to do posts for, and I just couldn’t muster up the energy. Either way, what did we think about Part 4 as a whole? One of the things I’ve always admired about Hirohiko Araki and his work on JoJo is the flexibility with which the story changes location, style, and even protagonist, all the while remaining unmistakably still the same work. That said, I was a little worried about Diamond is Unbreakable before it began, as it marks such a drastic move away from previous entries in the franchise. While Parts 1-3 of the Jojo saga were clearly very different from each other, they all still hewed to the basic framework of the classic battle manga, blasting through grotesque underling before facing down with an evil mastermind ripped straight from the frames of a Republic Serial. In contrast, DiU takes all of those well known tropes and casually discards them, resulting in a show that still bears the distinct JoJo style but is a very different beast from its forebears. Gone are the globe trotting adventures, insanely muscled heroes and cackling masterminds. Instead, we’ve got the action anchored back ‘home’ in Japan, a much smaller tighter focus, and a villain who represents a subtler, more insidious type of evil. In many ways it’s an interesting insight into the evolution of both Araki’s work and the manga market in general. Earlier JoJo’s were unapologetically men of the 80s, all oozing machismo and worshipping at the altar of Fist of the North Star and Golgo 13. Diamond is Unbreakable feels like the first JoJo installment that escapes that legacy. It’s less instantly iconic than its predecessors but more unique, imbued with greater style and elegance and a self-deprecating quirkiness that feels like Araki finding his own voice. The net result of that is a show and a story which I think is perhaps a little more uneven than its predecessors, but also much more unique, intriguing and characterful. As has often been observed, Araki’s use of Stands and their permutations became increasingly interesting as Stardust Crusaders went on, and it’s here that he really allows his weird and wonderful ideas to take centre stage. Almost every Stand user who pops up has a fun, interesting spin on the basic concept and this allows the story to enjoyably twist genre and play with viewers expectations. One of the key strengths of DiU is its variety and unpredictability, and while not every Stand is a winner, the most memorable (Heaven’s Door, Cheap Trick, Bites The Dust etc) allow the story to be mixed up in fun crazy ways that always keep you guessing and laughing in equal measure. The decision to relocate to small town Japan is also a brave one which has upsides and downsides. 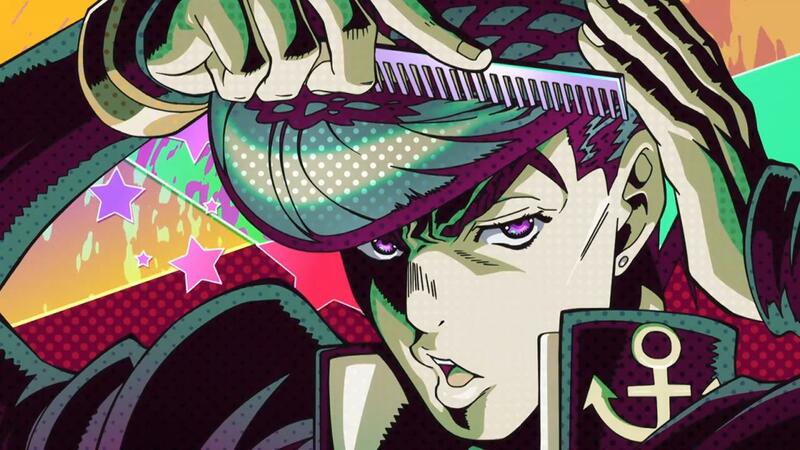 Despite the abundant love for Josuke, I must admit I’m not really taken with the character. His punkish demeanour is fun and Araki’s always insane dialogue makes him a high-powered quote machine, but he lacks the magnetic charisma of previous JoJo’s. Okuyasu is kind of a bust in general, a big lug who doesn’t do a great deal after his introduction. Koichi is the best of the main trio, an adorable underdog and everyman whose transformation at key moments into a stone-cold badass are legit punch the air moments, but to me the real appeal of this story lies in the utterly kooky cast of side characters and one-off cameos who pop on. Rohan is perhaps the least subtle author avatar ever, but his constant shittiness is a comedic delight and he’s by far my favourite character. 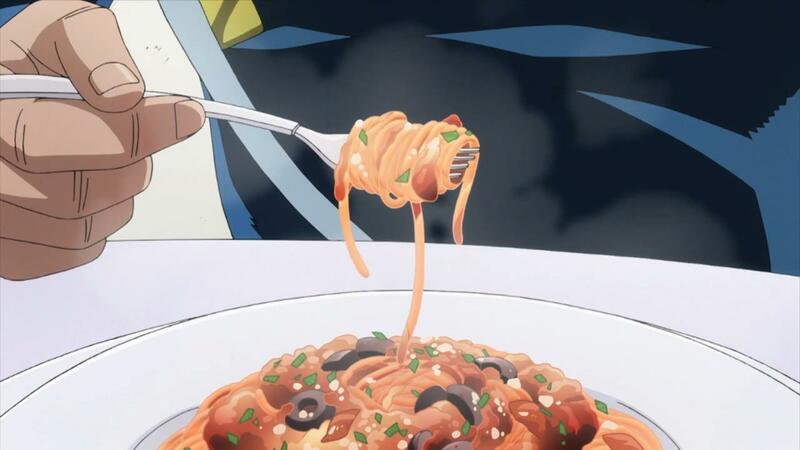 Weird one offs like Tonio Trussardi and Shigechi give the show an considerable amount of its odd charm and seeing who would walk into the story week over week was perhaps my favourite thing about the show. If there’s one person who dominates Diamond is Unbreakable though, it’s the malevolent Yoshikage Kira. 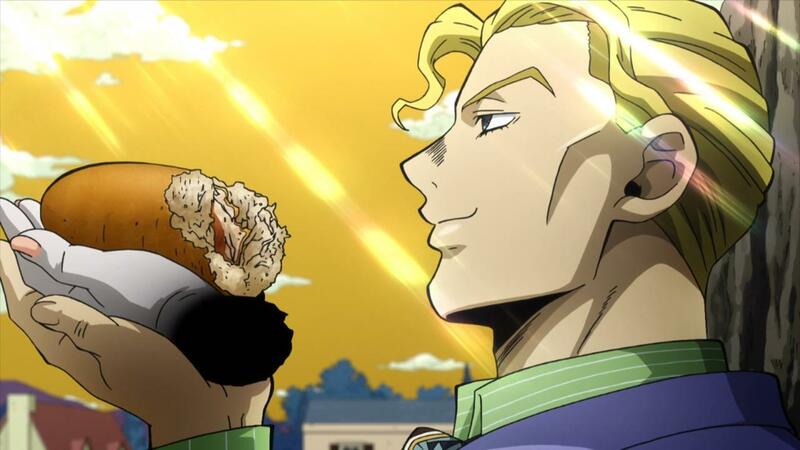 While he’ll never have the iconic value of DIO, Kira is in almost every way the best villain of JoJo so far, and a hugely important factor in what makes small-town JoJo work as well as it does. He’s a superb representation of the kind of understated, creeping evil which the series has almost entirely ignored so far, his politeness and pleasantness merely a facade to hide his absolutely black soul. Especially once he escapes our heroes and ‘becomes’ Kosaku Kawajiri, he’s a constant reminder of the kind of horror that can lurk in plain sight, brilliantly channeling Psycho or Silence of the Lambs for the idea of the sociopath behind the calm exterior. JoJo is famously not big on subtlety or deeper messages, but Kira’s ‘true evil is in the hearts of ordinary men’ arc is an impressively accomplished bit of writing and adds a great undercurrent of psychological horror to the story. Overall, I’d still describe JoJo as one of the most unique and refreshing anime experiences currently around. I haven’t even really talked about the production much, but the combination of Araki’s inspired style and David Production’s terrific execution, along with pitch perfect voice casting, makes this a show that’s still a pleasure to the eyes and ears. Is it my favourite JoJo? I think that depends on what day you asked me. Let’s just say that it’s a very good version of JoJo, and that in turn makes it one of the very best anime experiences around, period. 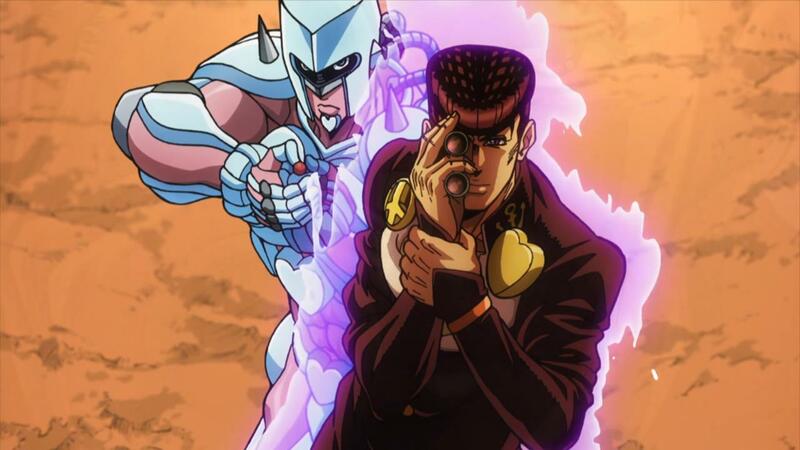 Diamond is Unbreakable is perhaps the first entry in the JoJo series since the introduction of Stands to truly live up to the namesake of bizarre adventures. Eschewing the classic battle Shounen roots that defined the first three parts, DiU is paradoxically JoJo at its most grounded and most weird. Josuke is not a musclebound hero like his predecessors, his enemies’ Stands challenge him in ways that can’t be solved with brute force, his friends consist of the kind of familiar locals and one-off weirdos of a small town, and despite the urgent matter of the murder mystery that pushes the plot, DiU does things at its own leisurely pace. So for every arc about Josuke trying to get rich off of using his Stand’s powers in incredibly petty ways, there’s an arc about him having a standoff with a literal rat with a machinegun (that’s somehow nearly killed the same man who defeated Dio Brando). 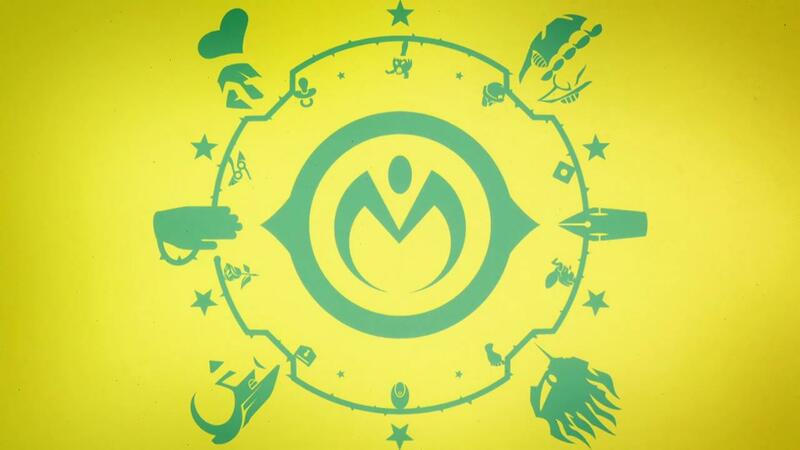 It’s that push and pull that makes Morioh’s inhabitants so compelling and likeable. While I’m not going to focus on the narrative too much since I was already familiar with it prior to watching DiU, I’ll always go to bat for my boy Josuke. Easily in the running for my favorite descendant of the Joestar line, Josuke handily sets himself apart from his predecessors in a way that reflects DiU’s unique differences. Josuke is arguably the first morally decent JoJo since Jonathan himself, but has enough teenage flaws to make him believable. He doesn’t have Joseph’s maverick bravado, but he’s cool enough to not need it. And where JoJo posterboy Jotaro is unflappable to the point of seeming robotic, Josuke is lively and eminently likeable. The fact that Josuke never returns to the spotlight after DiU is perhaps one of Araki’s greatest mistakes. Like Josuke, while Yoshikage Kira isn’t JoJo’s most iconic villain, he is certainly one of its most memorable. Kira plays into DiU’s more grounded formula and presents us with a villain that’s more relatable and threatening to the average person. The fact that Kira genuinely struggles to achieve his goals immediately sets him apart from the seemingly invincible Dio or the overwhelmingly powerful Pillar Men. It makes that very goal of wanting, “a regular life,” all the more chilling when you see the terrible lengths he goes to to achieve it. And if nothing else, that one of Kira’s greatest struggles was against a sentient cat-plant is just really fun. As a fan of the manga, David Production has once again done an excellent job of bringing Hirohiko Araki’s work to the screen. 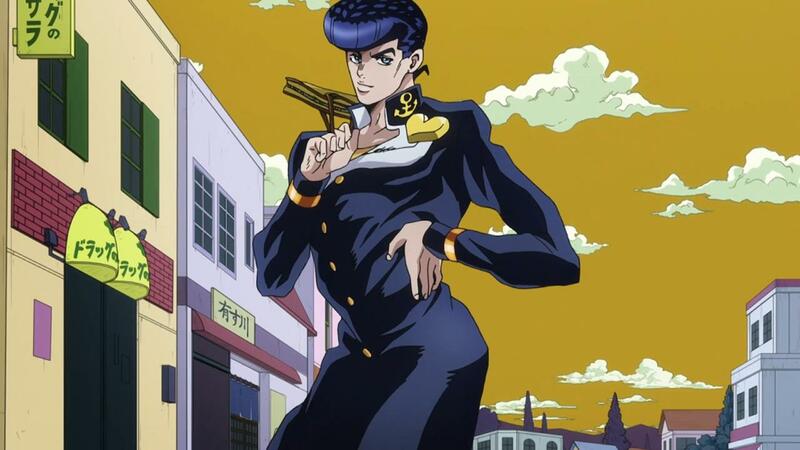 I have some minor issues (like the absence of a CG opening like the prior three JoJo adaptations) but overall, David Production has shown that over the course of their adaptations, they have developed a keen understanding of what it takes to make an anime posses the unique aesthetic that only JoJo can provide. 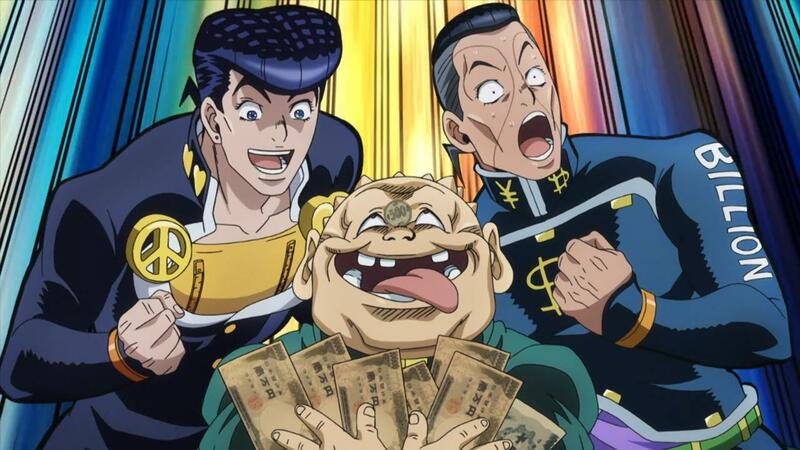 Overall, Diamond is Unbreakable is my favorite part since Battle Tendency. Like Battle Tendency, Diamond is Unbreakable is Araki at his finest, trying weird things and presenting us with unorthodox conflicts. It takes a step back from Stardust Crusaders’ bog standard Shounen trappings and does something genuinely new and interesting with its formula. With Stands being officially established as the de facto powers of JoJo, Diamond is Unbreakable is proof that Araki’s creation wasn’t a flash in the pan, but a distinctly interesting idea that could be developed into something truly unique. Between its undeniable sense of style, likeable cast, and compelling story, Diamond is Unbreakable stands out, even among the venerable JoJo name.